After a driver falls asleep and crashes into a Miami discount store, MaintenX crews respond and have the store back open and taking customers the same day. 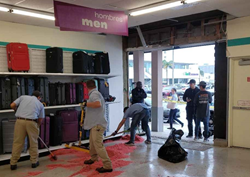 MaintenX technicians work quickly and safely to reopen a Miami store damaged by a tired driver. MaintenX was on the scene before noon. They secured the area, cleaned up the debris, framed and re-built the wall, and just a few hours later the store was open to customers. Early Tuesday morning a driver coming home from work fell asleep at the wheel and crashed into a Miami discount store. Fortunately, the store was not open yet and the driver appears to be unharmed. However, the situation did pose a problem for the store’s owner so MaintenX, one of the nation’s largest facility maintenance and repair companies, was called to assist with repairs. MaintenX was on the scene before noon. They secured the area, cleaned up the debris, framed and re-built the wall, and just a few hours later the store was open to customers. It was if the accident had never happened. A temporary wall was the first thing to go up so that the building could be secured, and the store could be re-opened. MaintenX continued to work on site while the store was open to complete the job and secure the building. One other consideration for MaintenX was to keep pedestrians safe. As the store was adjacent to the sidewalk of a major shopping center, the crew needed to ensure pedestrian safety while they worked. Although there were many interested onlookers, MaintenX technicians maintained a protected and safe work site. To learn more about MaintenX and their services, visit http://www.maintenx.com.